The portion of the neighbourhood bounded by Yonge, Jarvis, Maitland and Carlton Streets was once the estate of Alexander Wood, a merchant and magistrate in Upper Canada who was at the centre of a strange, supposedly sexually related scandal in 1810. His lands were derisively known as "Molly Wood's Bush" in the early nineteenth century — "molly" being a contemporary slang term for "homosexual". In the Spring of 2005, a statue of Wood was erected at the corner of Church and Alexander Streets (the latter named for Wood), honouring him as a forefather of Toronto's modern gay community. Church Street and the area around it has been familiar to the Toronto gay community for many decades. Prior to the 1970s there had been an underground (mostly male) gay scene centred around various bathhouses and bars around the city that were not exclusively gay establishments but were known to be frequented by homosexuals. Allan Gardens, just east of Church Street on Carlton, was a well-known cruising area for gay men. From the late 1960s through the early 1980s the focus of Toronto's gay subculture was the Yonge and Wellesley area. The most notable bar for the gay subculture was the St. Charles Tavern on Yonge Street (one block west of Church) just south of Wellesley. During the 1970s, the bar was the focus of many attacks by homophobes, especially on Halloween when the tavern held an annual drag contest that had been proceeded by an outdoor promenade until attacks by homophobes hurling eggs and rotten fruit made that impossible. The Glad Day Bookshop, for many years the city's only gay oriented bookstore, opened on Yonge Street near Wellesley in the mid-1970s. 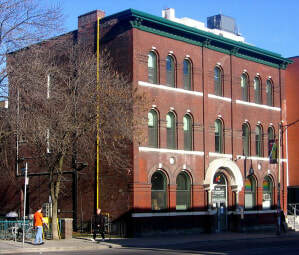 There were also a number of gay-oriented businesses and clubs on the side streets running west off of Yonge street around Wellesley, in particular St. Nicholas Street, a laneway running behind the west side of Yonge, and St. Joseph Street, one block north of Wellesley running west off Yonge. The streets and alleys between Yonge and Bay also became a cruising area frequented by male prostitutes and their clients referred to by the police as "Track two". Church Street, one block east of Yonge, started to become a predominantly gay area, and the centre of the gay life in Toronto, following the 1981 Toronto bathhouse raids, an event that galvanized the gay and lesbian community in the city. George Hislop, a gay businessman and co-owner of one of the raided bathhouses, ran for Toronto City Council with his campaign headquarters located at Church and Wellesley. He was the first openly gay person ever to run for political office in Toronto, and only the second in Canada.